2018's Death Wish is my latest write-up. It's not a horror film per se despite director Eli Roth at the helm. Yeah Roth occasionally dabbles in torture and stomach-churning gore with "Wish". Still, he crafts an exercise in style that shows sheer, off-genre maturity. The action sequences in Death Wish are virtual perfection from a storyboard standpoint and the script by Joe Carnahan, well it's diverting and purely machismo. 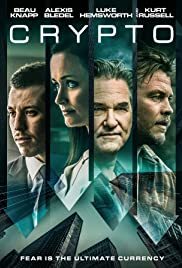 If you live in Chicago like I do (Chi-Town is "Wish's" urban setting), then this flick will give you a perturbed feeling as you exit the theater. With all the school shootings and club shootings that have happened in the U.S. recently, Death Wish may have garnered bad timing with its release. Nevertheless, I'm gonna recommend it because it pretty much eclipses the quality of the original Death Wish vehicle from 1974. "Wish's" lead is none other than Bruce Willis. After phoning in performances via direct-to-video sludge like The Prince, Precious Cargo, and Acts of Violence, Bruce finally gets to shine here and does so. It feels like forever since he's been on screen at the local multiplex. Roth brings John McClane back from the dead and there can't be anything wrong with that. Anyway, the story of Death Wish involves Dr. Paul Kersey (Willis). Kersey has a loving wife and a daughter set to attend college. One night while Paul is performing surgery at his resident hospital, some robbers invade his home, kill said wife, and put said daughter in a coma. Because the cops don't dig deep enough into the investigation, Kersey becomes a vigilante and takes the law into his own hands. He vows to catch the scumbags that took his life from him and maybe help others from Chicago's vile criminals bent on ruining society. In the original Death Wish, the late Charles Bronson played Paul Kersey. He was stone-faced, had a decent screen presence, and blew bad guys away on a dime. 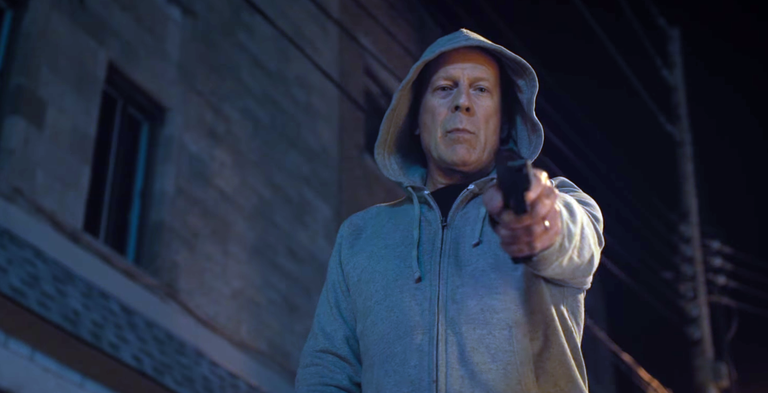 Bruce Willis with hoodie and itchy trigger finger in tote, steadily outdoes Bronson in the acting department. He shows added emotion and manages to flesh out his character more. Whereas Bronson came off as a second-tier Steve McQueen in '74's "Wish", Willis does his best work in years. As the king of grimacing while firing an automatic weapon, Bruce is back with a chrome dome noggin and a level of superior badassery. In conclusion, the one thing the original Death Wish has over the new Death Wish is the jungle-style musical score by Herbie Hancock. Otherwise, this is Eli Roth successfully rebooting the Death Wish franchise with updating, social media outlets and splashy, B-movie residue. Sure his villains lack character development and Roth's overall premise is far-fetched. Nonetheless, Eli portrays the "Windy City" as hell on earth and that supplements his nastily violent vision. They say nothing in life is certain except "death" and taxes. Well you can add solid Death Wish remakes to that list. Rating: 3 stars.